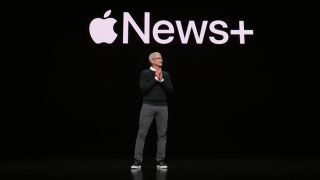 Apple News Plus has seen over 200,000 subscribers already sign up to the iOS news app, in its opening two days on the app store. With over one billion active iOS devices in use – across smartphones, tablets, and computers – that's around 0.02% of current Apple consumers signing up to the service. While that may not sound like much, the sheer number of Apple users out there means even a fraction of Apple's user base results in some big numbers. Apple News Plus is effectively a paid upgrade to the free Apple News service, which collates news articles from across the web in a handy iOS interface – but the paid subscription also brings in magazine articles and a host of other content that would be behind paywalls. Users will gain access to a portion of content from over 300 outlets such as Time Magazine, Vogue, The Wall Street Journal, The New Yorker, The Los Angeles Times – and the likes of MacLife, T3, and Retro Gamer from TechRadar's own parent company Future Plc. Apple New Plus costs $9.99 a month in the US ($12.99 in Canada), where it launched on March 25 – which is less than many of these outlets would charge for a standalone subscription. The service has only gone live in the US so far, but its opening numbers suggest Apple News Plus could grow into a sizeable source of income for the tech giant. While many sites (like ours) rely on a certain share of online advertising, paywalls are often the best way to ensure a regular monthly income from a site's readers. But signing up to a handful of news outlets can quickly become expensive. An aggregated news app across one billion devices could prove a lifeline for paywalled outlets struggling to get in front of readers, though it could also limit the direct revenue those outlets receive. After all, Apple will be taking their cut.